Foot and ankle anatomy is quite complex. The foot consists of thirty three bones, twenty six joints and over a hundred muscles, ligaments and tendons. These all work together to bear weight, allow movement and provide a stable base for us to stand and move on. The foot needs to be strong and stable to support us yet flexible to allow all sorts of complex movements with activities such as walking, running, jumping and kicking. Here, you will find an overview of the different structures that make up the various aspects of foot anatomy, how they fit together and what can go wrong. To find out more about each, click on the relevant section. When thinking about foot and ankle anatomy, we usually divide the foot bones﻿ into three categories: the hindfoot, midfoot and forefoot. 1) The Hindfoot: the hindfoot comprises of the ankle joint found at the bottom of the leg and is where the end of the tibia and fibula meet the ankle bone known as the talus. It also includes the heel bone, known as the calcaneus. 2) The Midfoot: The five bones of the midfoot are what make up our foot arches. They are arranged in a pyramid shape to be the shock absorbers of the feet. There is the navicular, cuboid and three cuneiform bones in the midfoot. 3) The Forefoot: There are nineteen bones in the forefoot. The five metatarsals connect the midfoot to the toes and fourteen phalanges make up the toes themselves. For more information, see the dedicated page about foot bones. Common problems that arise in the foot bones include hammertoe and mallet toe, turf toe, bone spurs and bunions. 2) The Extrinsics: The muscles that originate from the front and back of the lower leg and attach into the foot such as the calf muscles, gastrocnemius and soleus. Muscles work in pairs, simultaneously contracting (shortening) and relaxing (lengthening) to allow controlled movement. They are arranged in layers and are responsible for maintaining the correct shape of the foot for example the foot arches. The muscles attach to the foot bones via tendons. The most common problem affecting the foot muscles is tendonitis, where there is inflammation and degeneration of the tendons (the cord part of the muscle where it attaches to the bone). Find out more in the foot tendonitis section. Ligaments are strong, thick fibrous bands that connect bone to bone and hold them together. They are a really important part of ankle anatomy as they are the primary stabilisers of the ankle. There are eleven ligaments around the ankle, connecting the various different bones of the hindfoot and midfoot. The most common injury is a ligament sprain most commonly of the lateral ligament, aka anterior talofibular ligament. 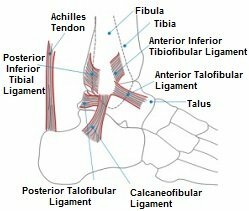 You can find out more about the different structures in foot and ankle anatomy, including what happens when the various structures are injured, by using the links above.